Some weddings will resonate more in your mind than others as times go by. Jody Tallant & Brittany Hattaway from Georgia were married on Saturday April 23rd at 6pm in front of a beautiful Townhouse that they rented a little bit north of Hiles Blvd in New Smyrna Beach, Fl. 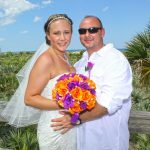 It will be memorable in many ways as this fun couple had 50 awesome guests at a gorgeous beach wedding setup and held their reception at the SeaScape Restaurant at the Best Western New Smyrna Beach Hotel & Suites. The couple chose the Maya four post bamboo arch with white and burlap, 26 chairs with slip covers and burlap sashes, tiki torch aisle markers, sand ceremony and ceremony music. Paradise Beach Weddings provided many wedding planning services including locating the townhouse, booking the reception venue, reception setup and all day photography.